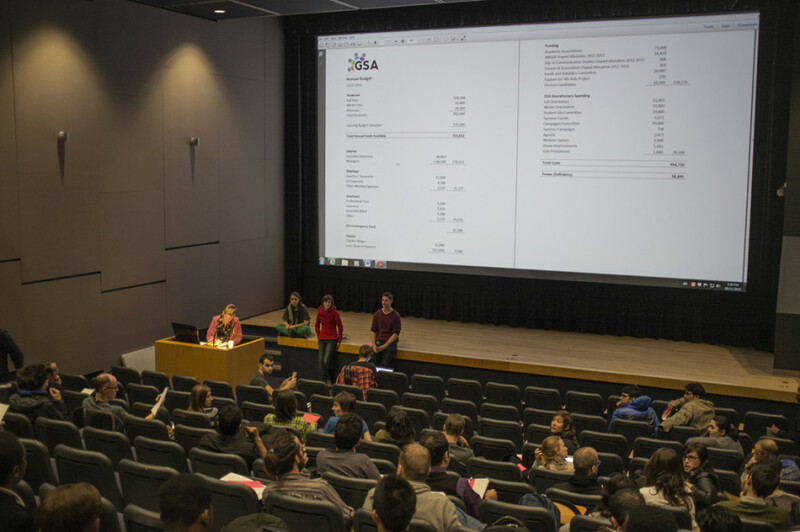 Concordia’s Graduate Students’ Association had money on its mind in its first general assembly of the school year last Friday—and apparently for too long. The meeting, held in the LB building’s J.A. de Sève Cinema and set to begin at 4 p.m., got underway about 40 minutes later when the required quorum of 63 members was obtained. But as a result of an unexpectedly lengthy debate over the association’s budget the assembly did not have time to discuss new business or proceed with elections before quorum was lost and the meeting had to be adjourned. Dan Parker, an education student, told the assembly that he was disappointed with how it chose to spend its time. “This is a bit similar to the last general assembly we had, where there are a lot of people who are suspicious about the way the GSA is spending its money and [who are] frustrated about where the money is going,” said Parker. “And I understand that. But what I suggest for you to do is to get involved in, say, the Budget Committee. “I hope that the people who want to really change things—you probably have good ideas—get involved in the GSA, find out what’s going on there, but don’t waste our time here,” Parker continued. The assembly responded with applause. The debate on whether to elect people to the still-vacant new positions of VP Mobilization and VP Academic and Advocacy or to abolish these positions will be put off until the next GSA general assembly meeting, likely to be held in January. Notably absent from Friday’s meeting was association president Mohit Sharma, who is recovering from an illness that had him hospitalized for three weeks. As for the GSA’s annual budget, members were clearly concerned about it and took much of the meeting to discuss it. Several complained about a lack of details in the document, making requests for clarification and further information. Others questioned how it was drafted and criticized expenditures perceived as unnecessary. As a result, a number of motions were put forward. Finance Manager Jamie Goodman defended the budget and the budget-drafting process, and responded to questions by assuring that more detailed information would be made available on the GSA website this week. However this did not appease the membership, which voted massively in favour of a motion proposed by Arts and Science director Sara Breitkreutz demanding that it be presented with a more detailed budget at least 10 business days before future general assemblies. There was also considerable debate surrounding GSA spending on cable television service, which amounts to $35 per month, according to Goodman. A motion to eliminate this expenditure was put forward by Arts and Science director Trevor Smith and carried by a slim majority, with numerous members requesting that their opposition be noted in the minutes. Another motion to redirect these funds towards the Concordia HIV/AIDS Project garnered relatively little interest but was also approved, with most members abstaining. There was one last motion put forward by a member in response to the budget, proposing to limit salaries to five per cent of total revenues—later amended to 30 per cent—but this was categorically rejected by the membership in a vote. Finally, after nearly a full hour of discussion and debate, the amended budget was approved. Under the heading of business carried over from its last meeting in April, the assembly voted to approve a motion to amend Article 19 of the GSA bylaws in order to require that general assembly meetings be held at least twice a semester, excluding the summer. The motion also amended Article 5 so that the GSA’s representative on Concordia’s Board of Governors and four representatives on the university’s Senate—the body that has authority over academic regulations and programs—be chosen by members during the regular full elections in April. Another amendment to GSA bylaws—namely Article 21 regarding the procedure for bylaw amendments—was passed in April but was revised following legal counsel. A motion to revise the amendment, put forward by the bylaws committee and supported by Breitkreutz, carried easily with a two-thirds majority. The motion outlines three ways that a proposed bylaw amendment can be brought to the general assembly: whether through council by the bylaws committee or by a member, or through a petition with at least 40 signatures, including 10 from graduate students in each faculty. Additionally, Smith presented a motion to have the GSA support the student-led environmental initiative Divest Concordia and join in its demand that the university stop making investments in the fossil fuel industry. The motion passed with minor opposition.